Energy storage systems have been around for a few decades, but solar batteries for home use have only just entered the market. As California utility costs continue to rise, more homeowners are looking for energy alternatives to cut expenditures and keep their lifestyles. Solar batteries for home us can add a significant economic benefit to your life. You will also be indirectly affecting the environment in a positive way. At West Coast Solar, we believe renewable energy is the future, and we’re here to help our customers make the switch to solar power. 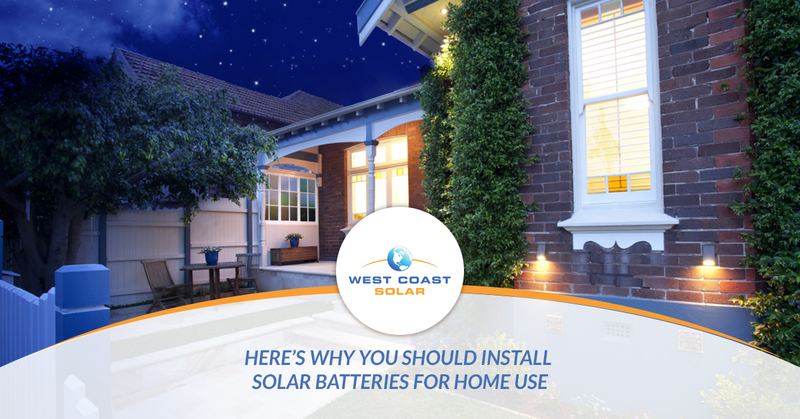 In this post, we’ll discuss what solar batteries can and cannot do in home use. What is The Best Use of Home Solar Batteries? A typical day of use for a solar battery starts and stops before peak-hours sunlight. This means that a home with a solar system stores excess energy generated during the day in solar batteries for use outside peak-hours. The solar system then uses the energy it generates during peak sunlight hours to power the home. In the evening and throughout the night, solar batteries power the home. How your electricity provider charges you for your energy use will determine if a solar battery is worth installing to save money. In areas with “net metering,” you will be sent a credit from your utility company for energy sent back to the grid from your solar power generation. If you’re a homeowner in this situation, a solar battery most likely won’t help you save money, since you’re getting paid to store it on the grid and not at your home. As electric companies change their energy-use rates, the installation of a solar battery bank is advantageous. California has implemented a new policy that requires rates to be paid as time-of-use (TOU) instead of kilowatts per hour (kWh) for homeowners who install solar batteries. Do TOU rates affect solar savings? If you live in an area with TOU rates, your kWh rate will change depending on the time of day. When electricity is used the most, the kWh will cost more. For example, in the late afternoon and evening hours, electricity is in high demand, which means it will cost more to use. You can benefit from a home energy storage system to reduce electricity cost by using stored energy instead of the grid energy during peak hours. Do demand charges affect solar savings? Demand charges are typically determined by how much electricity you use or how much you use during peak hours. These charges could be allocated per day, week, or month, depending on your electricity service provider. If you’re in this situation, a home-energy storage system will certainly benefit you. You can purchase energy during low-hours and use the stored energy during peak hours, instead of paying demand charges. Does net metering affect solar savings? As mentioned briefly above, true net metering you may be able to gain a credit from the grid equal to amount of the kWh cost of the electricity you produced with your solar system and sent to the grid. However, in most states, the homeowner is paid the “avoided cost” of electricity “sold” back to the grid. This means that the cost at which the electric company would have bought the power somewhere else is the credit you receive otherwise known as wholesale. In states that offer wholesale credit for electricity sent back to the grid, installing a solar battery is a great investment. It’s more advantageous to store and use your own energy than it is to get paid a percentage less than actual cost to send the energy back to the grid. If you’re fortunate enough to live a “true” net metering area, you may not want to install a solar battery bank. You’re getting paid retail for the energy you’re generating, so storing the energy and using it later has little to no advantage. It may be better to just get your credit from the electric company. Can Solar Batteries Take A Home Off-Grid? The simple is that it depends. If you invest in one or two solar batteries, we advise you don’t go off-grid. Each solar battery can store one-to-three hours of energy, which isn’t enough energy if you happen to have a string of low production days with your solar panels. However, there is a way to go off-grid with the use of a solar battery bank, solar panels, and a backup power source like a generator. A solar battery bank can store energy that can be used for days. This means your home can be powered for multiple days without peak solar panel energy production. A backup generator also adds a layer of assurance in the case of a power outage, solar panel damage, or some other unforeseen event. West Coast Solar: We Keep Solar Simple! A solar battery addition to your home can be a great investment. You’ll be able to store energy for use later, avoid demand charges, and take advantage of TOU rates. If you don’t already have a solar system installed on your home, you can benefit further adding a solar battery bank to your system. Ready to make the switch to solar power? Give us a call today!